This year a business opened in downtown Vallejo which sells furniture and upscale household items that have been purchased at estate sales and antique stores and refinished with an eye for artistic enhancement. 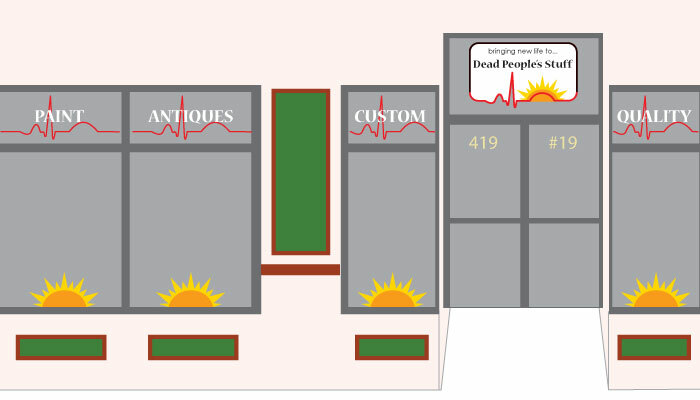 I think the name of the store is very clever – Dead People’s Stuff. I was asked to create their logo and business cards and then artwork for the signage on the building. I went to the store and measured all the windows and doors. I came up with this scale diagram which shows the windows, doors and the way the building is painted to show the owners how the finished signage would look. This took the guessing out of it which they loved. I then created the art for each window and interacted with the sign company who would create and install the vinyl signage. This entry was posted in Business Cards, Design, Logos, Signage, Uncategorized on February 15, 2015 by NollDesign.